Are Zwift Speeds Unrealistically Fast? When you compare your Zwift speeds to outdoor speeds, which is faster? Zwifters tend to find their speed in game is faster than their speed outdoors, typically by a margin of 1-4km/hr. This can be disconcerting since many riders set fitness goals based on miles ridden per week. Zwift’s algorithms for calculating speed are incorrect. Zwift’s calculations include assumptions (such as your position on the handlebars) which do not reflect your outdoor rides. Outdoor rides are slowed in ways Zwift rides are not. Zwift gives you more opportunities to draft. Let’s look at these possibilities in detail and figure out what’s really happening. Formulas for calculating bike speed are fairly established, straightforward and reliable (see some details about that here). I highly doubt ZwiftHQ’s experienced game physics programmers have made any major errors in this area, so I’m going to dismiss this as an issue. Do you spend most of your time on the flats, on the hoods, or in the drops? How high is your seat, and how tucked in are your elbows, knees, and head? How smooth is the pavement? There are other factors which affect your speed apart from the basics of road grade, power, weight, and CdA. Zwift has to make some assumptions here to keep things simple, and based on what I’ve seen, those assumptions are a bit generous. As you can see, Zwift speeds are consistently 1-2km/hr higher on average in the lists above. But here’s the interesting thing: small changes in the bike calculators (such as using tubulars instead of clinchers, or a slightly improved CdA, or a higher elevation or temperature) are enough to equalize the speeds. Additionally, the bike calculators don’t let you set which bike frame or wheelset you’re using, and we know those can significantly impact speed as well. Overall, I think it’s safe to say Zwift makes some slightly generous assumptions about your posture, equipment, and environment which do not reflect a typical outdoor ride experience. The difference these assumptions make in speed is reflected in the numbers above. Especially for riders living in high-population areas, ride speeds are impacted by traffic stops and slowdowns. Stop signs, waiting for cars, braking on steep descents, slowing to turn or avoid obstacles–all of these are common occurrences outdoors which never happen in Zwift. Then there’s wind, which doesn’t exist in Zwift but plays a major factor outdoors, rarely helping but often hindering our speed. And there’s coasting, which we do all the time outdoors, but very rarely on Zwift. Consequently, your Zwift average speeds will logically always be higher than your outdoor speeds for the same effort levels. 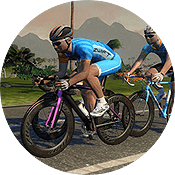 Drafting in Zwift, like drafting outdoors, results in a power savings of ~25%. If you are comparing your outdoor solo ride speeds with Zwift speeds, the draft effect alone will make a noticeable difference, since you often draft in Zwift even if you’re not taking part in a group ride. While a Zwift ride will generally be faster than an outdoor ride of similar effort, the differences are minimal and not enough to invalidate including Zwift miles in your training metrics. I think they developers were given the charter to err on the side of caution. Given the choice of being a little too slow, or a little too fast, I think ‘too fast’ is preferable from a marketing standpoint. If everything I did in Zwift felt a little slower than what I am doing outside, I might not be as excited about using the service. I completely agree with this. Before getting my own trainer and using zwift I used a bike at the YMCA with video and I felt like I was going nowhere. It was agonizing and I stopped doing it. At least in Zwift I feel like I’m going places…even though I’m going nowhere fast. The correct conclusion is don’t use miles or kilometers ridden as the metric of work done. Use power derived numbers (hopefully you have a well calibrated power source, as mentioned a different problem) such as TSS or KiloJoules of work done etc. Especially if you use the same power meter in and out of doors then you will have a consistent set of numbers always. Another factor is speed around corners. Most circuits have 90 degree bends – or even 180 degree bends – and Zwift doesn’t slow the riders when approaching, going through them or leaving them. In real life, you back off the power and slow for a good few seconds. Apparently (on average) a turbo ride is 120% more efficient than training outdoors which also helps add to the “it should be faster indoors” school of thought. Makes sense Rachel. Think I’d prefer the speed reducing by at least 10% then. Great blog post! I’ve been trying to reconcile why I’m able to hold 20-21 mph in Zwift while during my outdoor rides I was only averaging 18-19 mph (Though when I last got outdoors it was a couple months ago, when I first started Zwift). 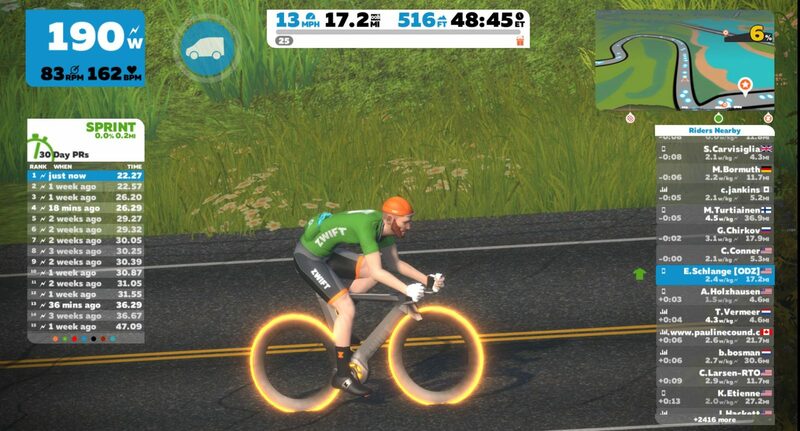 I wish Zwift would give us more options to add drag and slow ourselves down without messing with the rider height or weight to do it artificially. I personally don’t ride in the drops much outdoors, I’m always on the hoods. Add to that my bike is a heavier adventure road style bike that puts me even more upright so I can see where the discrepancy comes from. A couple of extra options in the rider customization to help close up this discrepancy would go a long way IMO. Select a slower bike (Steel w/ classic rims). If you don’t have that options yet, you will soon. They do. Ride the steel bike with classic wheels. If you need more drag, increase your height – that will artificially add drag while riding in the drops. Don’t ride the aero bikes with 808s. I don’t know why everyone focuses on speed for a virtual ride. Just focus on workout length (time) and TSS or IF. It’s still a trainer. I find http://www.analyticcycling.com/ to be the most accurate. at 300 watts zero slope and adding 8 kg for bike to my weight. 300 watts on TT bike with Zipp 8oo 43 kph on Zwift. It should match with a regular road bike with regular spoked wheels instead of the tt bike. But, maybe they matched the tt bike and simply added a bit of frontal area for other zwift bikes. (rather than working backwards. Stop comparing the two. Remember, this is a training platform. Ask yourself, am I getting faster on Zwift? If you are, then you will be faster on the bike. It’s that simple. Have fun. Ride on! ? My vote is that it is pretty close to reality. I am really close to my actual climbing speed given the grade/gearing/heart rate. I’m a noob to the Zwift community but can say enough good about how fun this is. This has definitely been a great investment!! Plus 1-3 miles an hour faster? IMHO, that is peanuts. Pretty sure they could factor in a Head wind algorithm. Or direction just to make it interesting. It would be great to factor in random wind conditions that change constantly like outdoors. It would be nice to see the wind speed and direction on the data points on screen so you could get an idea what extra effort is being done. cross winds, head wind and tail wind are all real factors that add effort or take it away. Possibility #3 is very much highest factor in my opinion and no winds on Zwift. Staying away from traffic brings my avg speed to range of achieved at Zwift. Are you serious? I thought everyone was aware calculations #1 are incorrect. You can clearly see from the examples at #2 that the 100kg rider is far slower in zwift than he should be according to the calculator, while in the other examples the lighter rider are faster in zwift than with the online calculators. A 50 kg woman took a minute off me on a flat time trial she rode with 230 watts avg, while I was pushing 340w avg with my 90 kg. This can never happen in real life, of course I have worse aerodynamics but there is just NO way. At the recent hammerfest there was a 2km sprint through the underwater tunnel and I was going 500w avg. The sprint started with the small descent down the ramp. My friend with 65kg weight rode around 400w avg and he was actually going faster in the flats with no visible advantage for me because of the small descent. exactly right. The big guys pounded on zwift. Very little draft, and real tough to generate watts on the downhill. They should leave the watts alone and bonus the speed in the draft, so as to let rider adjust. Instead they handicap the watts. The effort in the draft doesn’t reflect the watts. On the downhill, do the same. Time will decrease the watts generated by the rider. Heavy guys should go down hill with less effort. Not on zwift. I think Zwift is fairly accurate in the speed department, especially when you take crappy roads, nasty winds, red lights and cars getting in your way. The way I look at it is if a cyclist had the run of a fresh paved road with no cars or traffic lights in sight, I think, in a perfect world, reality would be on par with virtual reality. I get far more out of the controlled conditions of a Zwift workout than I ever have in real life. Plus, after being run down by cars twice, Zwift is MUCH safer. Good chat. My issue is that my speed outside is generally slower on flats, no car issues, wind behind or into, than on my trainer with my Garmin. THEN when I use Zwift on flats, my Garmin is saying 30 kph and Zwift is saying 35 or more. I tried the help line, but through very nice and helpful, they didn’t really understand. 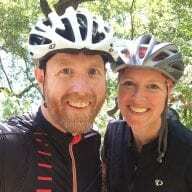 In the end I liked one of the comments above: I ride, get exercise, and my average speed in the spring might not be what I want it to be, but it will be better thanks to Zwift and all you folks! Happy New Year and Ride on. Because it can almost never match. Garmin shows indoors only how fast your wheel spins. The magnet on the wheel will never know if you are virtually riding downhill, uphill, what kind of virtual bike you have, what wheels or how much you weigh. It just counts the revelations and only place it could realistically work is outdoors. I think the difference is that Zwift feels like riding on a perfect road surface whereas in reality most are a fair bit slower. I’m as fast as Zwift on a new slick road. Not having to slow for traffic and junctions is a huge factor. Slowing down and speeding up scrubs a big chunk of your average speed. If you ride on closed roads in a Gran Fondo style of event you will really notice this. I am 4-5 km/h faster on closed roads. Another factor is how you measure your speed on the road. You can get big discrepancies between GPS and speed sensor measurements, as the GPS will ‘smooth’ the route and effectively shorten the distance ridden. I have seen differences of 0.5-1 km/h. If you’re using a speed sensor you would not believe the number of people who calibrate incorrectly with wheel circumference. The moral of all this is not to pay any attention to average speed – it is irrelevant. Power/weight is all that matters, and that’s what Zwift delivers even if you only have a classic trainer. Simple way around this. Do a zwift ride with your cycle computer (if you don’t already) and if you have a speed sensor either on your bike or built into your trainer use that to get your actual avg speed and distance distance covered based on the revolutions of your wheel or flywheel. I don’t train based on speed/miles, but I do log them and in the case of zwift I log the speed and miles from my bike computer and not what zwift reports. My zwift speed and miles are always a bit higher. The reason why I don’t wear a helmet on Zwift island is the same reason why I believe Zwift does not need to reflect the real world 1:1. What counts are watts, and they are quite comparable to what I push IRL. I agree – Zwift doesn’t seem overly ‘fast’ compared to my IRL riding – Watts vs Gradient vs Speed seems to fall into line fairly well – given that Zwift does not have wind affecting the output speed. I do believe, however, that Zwift draft-effect, particularly in BIG bunches, is somewhat better than IRL – though how much, i cannot say. Great article! Does Zwift pay attention to wind, road surface and rain/snow? If it doesn’t its like riding in vacuum. That’s would explain greater speed.. Yes. Even after taking into account all mentioned conditions like constant drafting and non existent braking, Zwift speeds are unrealistically fast. I think Zwift assumes unrealistically low CdA, Crr and Rho parameters. Road surface smoothness certainly has an effect. Streets on Zwift are perfect. I haven’t noticed a difference between riding on Zwift’s gravel roads and riding on Zwift’s asphalt roads. And not only that: we will rarely pick the optimal line. 25 degrees is a very optimistic pick. I think the majority of us will encounter these temperatures in the minority of their days. Even though higher temperatures (as recently encountered at the Tour Down Under) will decrease power output for other reasons, and hence would slow us down again. I also think we tend to underestimate the actual riding weight of our bike. To the weight of yourself and your bike, add clothing, food, pump, tools, water bottle(s), electronic equipment, keys… I don’t know if Zwift incorporates any of these, but somehow I doubt. I expect Zwift’s weight to be the net bike weight plus the rider’s input weight. The difference between the system weight in Zwift and outdoors therefore will easily reach 2kg. This one doesn’t show in Kreuzotter’s calculation, but consider that you need to accelerate the extra weight after every turn. Finally, my outdoor rides tend to be longer than my Zwift sessions, and the longer the ride, the less I’m inclined to go full gas early on. The longer the Zwift session, the less I’m capable of maintaining the same power level. One other factor is coasting. I rarely, if ever, coast while riding indoors. Outside, unless I’m in a race or fast group ride, I often coast or push many less watts when descending. I imagine that is also a factor. So, as others said, I rely on watts. I analyzed my last 200 rides and found Zwift to be exactly 1.0mph faster than my outdoor rides. I’m chalking that up primarily to #3. I never have to slow down for anything on Zwift. Wind is also a non-factor because once you’ve traveled 360 degrees it cancels out. The only thing that’s not realistic is that on Zwift you never get those awful terrible days where the wind shifts half way through your ride so you do the whole thing against the wind. In most cases, though, it’s fair how it is currently done. There’s also the difference between riding a Tron bike in Zwift and a round-tube brick in the real world. My son & I were doing “recovery” rides at 20+mph on Zwift. I had him switch to the steel bike on classic wheels, and it made a HUGE difference that much more accurately reflects his real-world abilities. I’m still faster outside. 100mile ride i averaged last year 25mph with a group. On zwift even with a lot of drafting 23. Solo I get about 22mph up to 2.5 hours. On zwift I average 20-21 solo. A little faster working with a small group and I use the tron bike on zwift. Before the Tron bike I was about 1.5-2.5 mph slower on zwift. I use a powertap hub for both real world and zwift. I understand smart trainers seemed to be programmed with a extra watts. Also single leg powermeter can be way over or under on watts based on your dominant leg. That being said, below 2 watts a kilo on flat appears to be faster on zwift and downhill appears to be slower also. I mean when can you coast to a stop on a downgrade of 2-3%. I usually accelerate on a coast to. Uphill seems to be slower than real life. So they tend to balance out if you do a little climbing. Also my sprints are way way more in real life by upward of 300w. 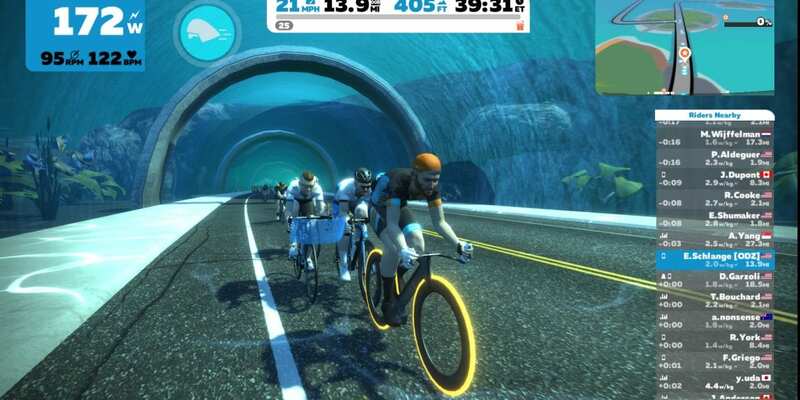 Zwift probably gives slower heavy riders an advantage and slimmer more powerful riders a challenge, to keep it more interesting for everyone. Interesting reading, since my experience is quite the opposite. At 88kg, ~380W ftp, I struggle to hold 42kph on zwift on the flat. But in the real world, the same effort would get me 48. I did 48.433km in the hour on my local track. I think zwift will always penalize heavy riders, since their estimates are based on W/kg. That’s strange to hear, Galen. Based on the many speed tests we’ve done (see https://docs.google.com/spreadsheets/d/1_dvNbBEKAztJwjX-2CDdWmVSR4jP92o-eiNCB7hl5IY/edit#gid=0) 375 watts should have you right around 43-44km/hr in Zwift. This lines up with what bikecalculator.com shows. If you were able to do 48km/hr at that power, perhaps you were much more aero than Zwift of BikeCalc takes into account? That’s the only way I can explain it. Zwift doesn’t base its estimates on w/kg… it’s based on watts, and rider weight is factored in along with other factors. So there shouldn’t be any more of a weight penalty on Zwift than you’d get outdoors. 500w @90kg is about 5.5w/kg while 400w @65k is about 6.5w/kg. In all cases 1+per kg is always faster, up hill downhill flat. It means more of his muscle is actually working to propel him forward. My speed on Zwift is about 50% too high. I can do about 25 kms in an hour on flat quiet roads, and other turbo software. On Zwift I do about 40 kms. Power output is similar to what I get elsewhere on my turbo (Rouvy, Elite phone app). I’d check your weight tinkerbell, or maybe what David says is correct. As for the other posts. I used both a power tap rear wheel, and have no shifted to the quarq d zero crankset. On each I generate more watts than on zwift. I am within 15% on maximum efforts so as long as its consistent I don’t worry too much. Until I ride with my club mates on Zwift. Then I really notice the disparity. Speed to me in zwift is pretty close. But then again I’m on high end aero parts and my body cda is very low. I’m in a very aggressive position just like my zwift avatar. Drafting on the other hand is way off for me. Drafting 1 person who is 5’11 in real life I’m at 50% of their Watts. I almost can’t even tell I’m drafting in zwift. I checked a group ride last summer a 8 mile strech of almost flat road with a slight headwind I averaged 27.3 mph at 286w. This ride was shattered down to 4 riders by the last mile. Comparing virtual riding to outdoors is almost pointless. Even if your trainer is very realistic. What is important is the calculated speed on zwift relative to other cyclists. If your speed is slower than other cyclists on zwift but same in real world, then that can be annoying.